NEW BRITAIN - Robert Zapor looked up at the scoreboard and quickly brought his gaze back down to the field. Veterans Stadium had all but emptied for the night, and as the New Britain linebacker stood on the turf with a light rain coming down, he said what had been on the minds of many of his teammates. The Hurricanes’ football team (7-1) had just finished a 63-26 drubbing of East Hartford, a team many had ranked in the top 10 in Connecticut, on Friday to remain in the Class LL playoff race and hand the Hornets (6-2) a loss that will most likely keep them out. How many things could there be to really improve upon? Outside of a trio of long touchdown runs - 49, 50 and 59 yards - by East Hartford quarterback Raquan Tompkins, the Hornets couldn’t really do much of anything on offense. Take out those three plays and New Britain allowed just six points and 163 yards of total offense. The Hurricanes, meanwhile, racked up nine touchdowns and 518 yards. But looking at the bigger picture of the season, in many ways, it was a statement that has defined what this year’s Hurricanes are about: show opponents they are a legit contender, while also finding way to get better throughout the season, as good teams do. It’s something that wasn’t always there in the past. That’s a belief many of the New Britain players have, especially with the expectations the team had coming into the season from outside perspectives. Not many outside of the Hurricanes’ locker room expected them to be 7-1 through Week 9, let alone the majority of their wins coming via blowouts. The lone exception was a 3-point loss to Southington. And while trying to earn respect was a main talking point in the beginning of the year, New Britain has moved well past that at this point. 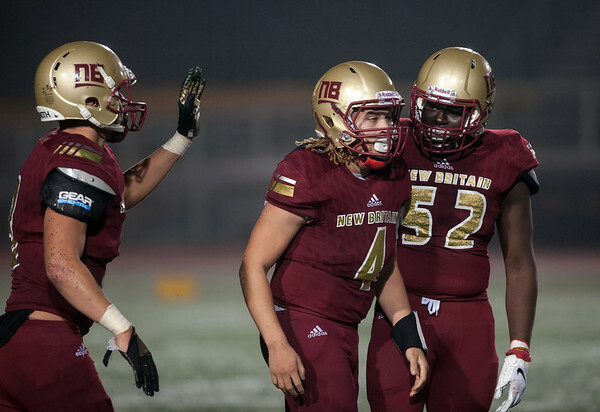 If opponents aren’t willing to give the Hurricanes their dues, New Britain is more than willing to earn in on the scoreboard. It’s been no secret the Hurricanes have managed to do that this season, where in years past they were often plagued by penalties, missed assignments and bad plays. It resulted in New Britain flip-flopping between wins and losses on a weekly basis. This season, the Hurricanes have often put teams away by the end of the first half. Over the first 24 minutes of play, New Britain has outscored teams 153-66 and 141-33 in the second half. And only three teams - Manchester, Southington and East Hartford - have managed to find the end zone more than twice. Are there still mistakes - bad plays and penalties - that shouldn’t happen? Yes. But now, those things happen less often and less glaringly. That type of attitude is going to be important, especially against a struggling team like Enfield (2-5) awaiting before an important showdown against Berlin (7-0) - which is coming off a blowout win of its own against Bloomfield - the week after. And with that, the Hurricanes are trying to make sure they keep the same focus that has gotten them to this point, one that has teams worried playing them, even knowing what New Britain is going to do on almost every play. Still, it’s hard not to notice a different feeling around a team that’s confident it can compete and win against anyone - opponent’s respect or not. Posted in New Britain Herald, New Britain on Sunday, 4 November 2018 20:52. Updated: Sunday, 4 November 2018 20:54.